Dr Caldicott is a pediatrician deeply involved in the effort to end humanity’s most ecocidal form of developed energy. Many of the fuel rod workers, she reports in this March interview, are prisoners and indigents. Dr Moret explains that radioactive particles released in nuclear explosions also weaken metals, leading to metal fatigue known as the Wigner Effect, which attorney Alfred Weber describes as follows: “The Wigner effect (named for its discoverer, E. P. Wigner), also known as the discomposition effect, is the displacement of atoms in a solid caused by neutron radiation. Here’s a handy conversion chart when officials use different radiation measurement standards, from Ecology News. Dr Caldicott concurs. “Every day since March 11, 2011, between 300 and 400 tons of radioactive water have been pouring into the Pacific Ocean.” At the top end, that’s almost a half million tons. Is there any wonder we see starfish turning to goo and sealife collapsing? When a uranium atom is split or fissioned…. about 300 different radioactive chemicals are created with each chain reaction. It takes hundreds of thousands of years for all the newly formed radioactive chemicals to return to a stable state. Dr Moret believes this is a deliberate and “covert nuclear war on humanity.” Any reasonable mind would have to wonder why Japan built 55 nuclear power plants on active faults, where four tectonic plates are colliding – especially after suffering Hiroshima and Nagasaki. accidentally or intentionally detonated nine nuclear-powered rockets headed to outer space. All that radiation rains down on us. It’s ubiquitous in the food chain, the atmosphere, our waters, and in our bodies. And it’s gotten oh-so-much worse these past several decades with the Nuclear Regulatory Agency created by and for the industry. It would be inaccurate to call the NRC a captive agency; it never was free, it’s always been run by the industry it was created to regulate. As the [Associated Press] discovered, another tool the NRC has employed to make it easier for the industry to avoid more rigorous safety practices is risk-informed analysis (RIA). Broadly applied since the 1990s, RIA has allowed regulators to ignore a more comprehensive set of safety concerns and concentrate only on areas of higher risk. Union of Concerned Scientists physicist Ed Lyman argues that RIA generally works “to weaken regulations, rather than strengthen them.” This approach also assumes all reactors to be equal and ignores the problems associated with older plants. One consistent lesson from Three Mile Island, Chernobyl, and Fukushima is clear: when the public is at risk, plant operators and government officials inevitably cover up and lie. “They lied to us,” physicist Michio Kaku memorably told CNN on June 22, 2011. But hope springs eternal. Dr Moret and others speculate that Tesla technology like HAARP, which manipulates the ionosphere, can also be used to mitigate ionizing radiation. Studies have also shown that certain whole foods (non GMO) can repair or mitigate DNA damage, a known effect of encountering radiation. Other whole foods actually protect organs and organ systems from radiation damage (providing a host of other benefits as well), and for this reason I take Juice Plus, a capsule of dried, high-quality superfoods and grains. 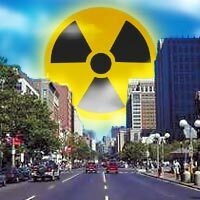 Over at Food Freedom News, we’ve also produced a list from various reputable sources of recommended foods to protect you from radiation, or mitigate its damage. It’s long past time to completely halt the use of nuclear energy and to “terminate the military” as Dr Bertell prescribes in her book, Planet Earth: The Latest Weapon of War. Humans can and must figure out how to resolve our differences without planet-killing wars and technologies.